American rock band the Continental Drifters started out in the early nineties as the house band of the Los Angeles club Raji's. This led to the band's first album released in 1994 and then their relocation to New Orleans. The band would release four studio albums and took in a local following around the area, until Hurricane Katrina hit the area and destroyed many of the band's homes. They have since gone their separate ways, reuniting only once in 2009 for the New Orleans Jazz festival. Members of the Continental Drifters included Peter Holsapple (The dB's), Mark Walton (The Dream Syndicate), Vicki Peterson (The Bangles) and Susan Cowsill (The Cowsills). On July 17th, Omnivore Recordings is gathering many of the band's unreleased recordings from the early days, including a demo version of the rock/folk ballad "Karen A" and early take of the country twang of "The Rain Song." Fans of the Continental Drifters will enjoy the alternative mixes of the southern rocker "Dallas" and the light-hearted feel of "Mr. Everything." This two-disc set also includes a second disc of the band's live songs, as well as tribute album tracks and other gems, including "A Song For You" from the Gram Parsons tribute album. The live songs on this disc are scattered from throughout the band's career, beginning with a live version of "You Don't Miss Your Water" from 1992 to "Farmer's Daughter" recorded at the band's reunion show in 2009. Also included is an amazing version of Neil Young's "When You Dance I Can Really Love" and The 5 Royals' "Dedicated To The One I Love." 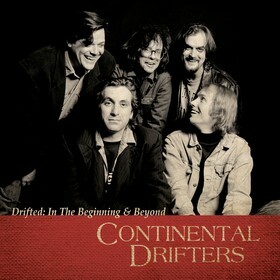 To find out more about this new compilation from the Continental Drifters entitled "Drifted : In The Beginning & Beyond," please visit omnivorerecordings.com.